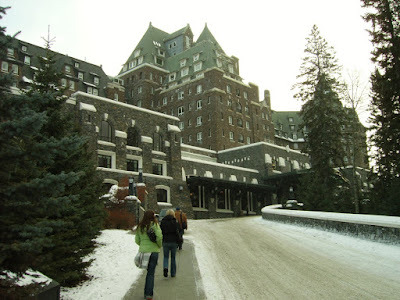 This is Banff Springs Hotel, the most expensive and beautiful hotel in the town. Although new by British standards, compared to the rest of the town and little of Canada I have seen, this hotel looks ancient. 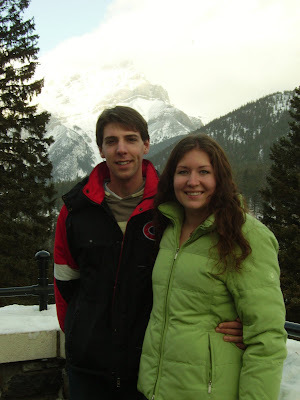 Sam and I stopped to have our photo taken at the back of the hotel. It was lightly snowing whilst the photo was taken. 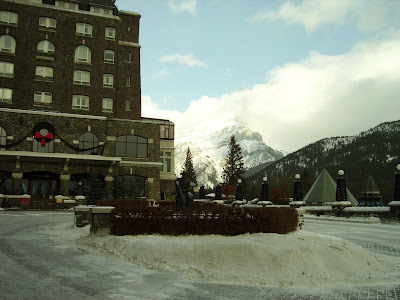 This picture shows both the bronze statue of the mounted policeman or `mountie' as they are affectionately known, the rear of the Banff Springs Hotel and the Rockies in the background. 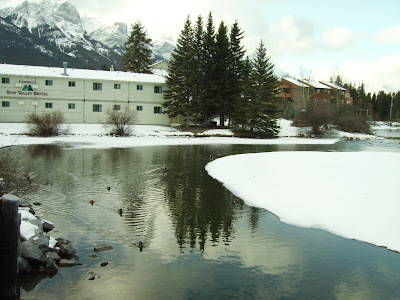 The rear of the hotel overlooks a magnificent golf course, and of course the river. 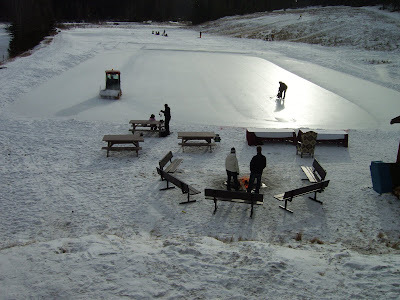 A small section of which was cleared to form this natural skating rink. The small vehicle on the ice is clearing the fallen snow off of the ice and polishing it ready for the skaters waiting in the foreground. A small log fire was started over which hot-dogs were being prepared. 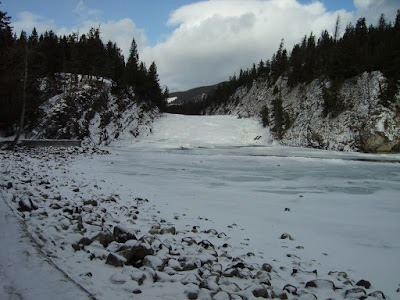 This is the Bow Falls. During the spring and summer this is a thunderous waterfall carving its way through the mountains. Today it was frozen almost completely. An equally impressive sight. 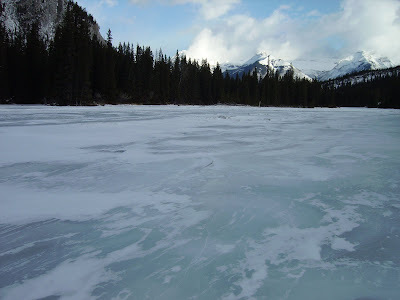 The ice was at least 8'' deep at the edges, with a narrow strip of free flowing water in the centre, about 3-4' wide. 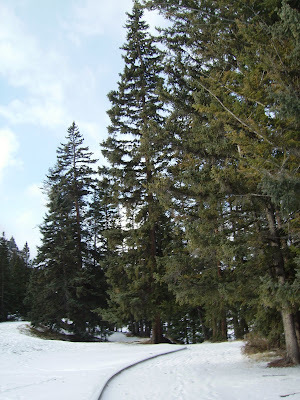 These are just some of the trees that line the fairway of the golf course. Deer tracks were clearly visible in the snow between the trees. 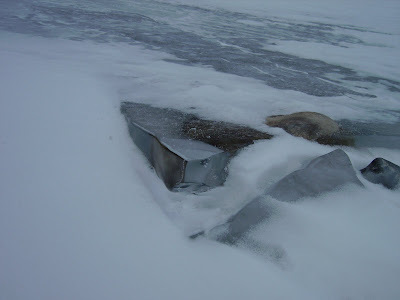 Protrusions out of the surface of the frozen river were noticeable. 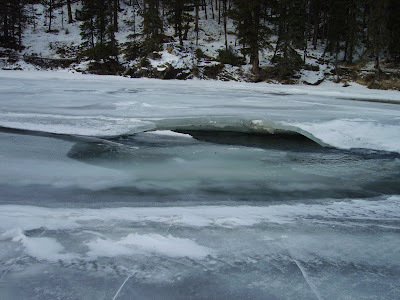 In the photo below, near the centre of the river, it is interesting how the entire sheet of ice appears to have been `lifted'. 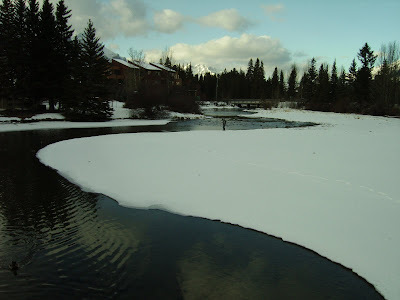 A similar protrusion is visible here, where water has frozen whilst flowing over rocks in the riverbed. 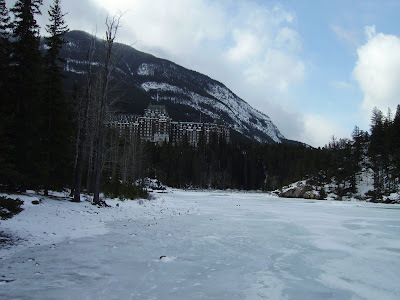 The ice was thick enough to walk right out into the middle of the river. 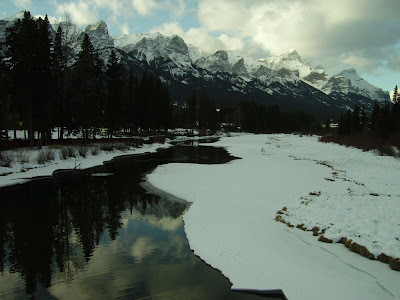 Looking back along the river the Banff Springs Hotel was just as imposing. 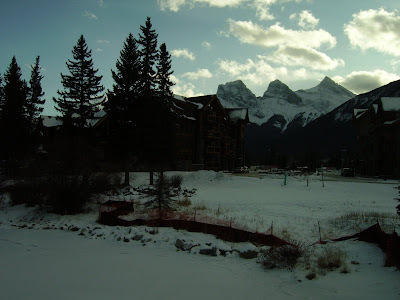 Approximately 15 minutes after leaving Banff you arrive in Canmore, which is another ski resort, although not quite as spectacular as Banff! 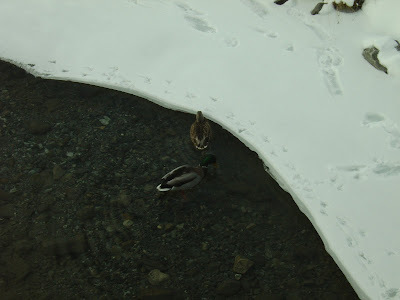 These ducks weren't deterred by the ice. The water could not have been any clearer.